Figure 1. Map of project area. The City was seeking to create better pedestrian and bicycle connections between Uptown and the South End neighborhood, which are separated by the inner belt line of I-277. The project converted S. Tryon Street from four lanes to three lanes with bike lanes and wider sidewalks between Stonewall Street and Carson Boulevard. 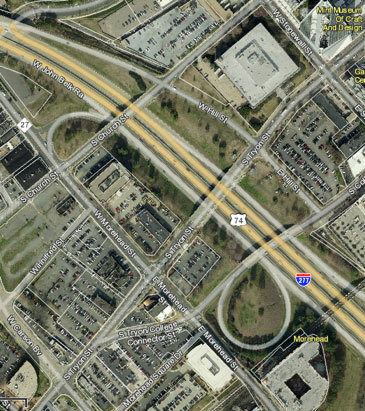 Primary improvements were on the bridge over I-277 between W. Hill Street and E. Morehead Street. 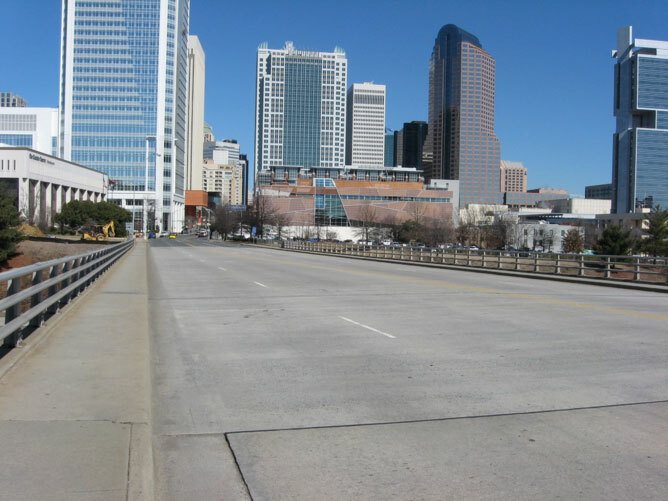 In 2005, Charlotte completed the Center City Transportation Study, which recommended creating better pedestrian and bicycle connections between Uptown and adjacent areas outside the I-77/I-277 loop (Charlotte Department of Transportation, 2005). One major connection is S. Tryon Street, which bridges over I-277 connecting Uptown with the South End Neighborhood. Running through the heart of Uptown, Tryon Street is an urban street lined with museums, restaurants, theaters and other destinations. It experiences heavy pedestrian traffic with sidewalks ranging from 12 feet to 16 feet width constructed of brick pavers for several blocks considered the “Tryon Street Mall.” However, the bridge over I-277 was not very pedestrian or bicycle friendly, with five vehicular lanes (two in each direction and a center turn lane), no bike lanes, and only 5-feet-wide sidewalks. South End residents and bicycle advocates voiced a desire to have better walkways between the South End and Center City. Figure 2. Street cross section on the bridge. 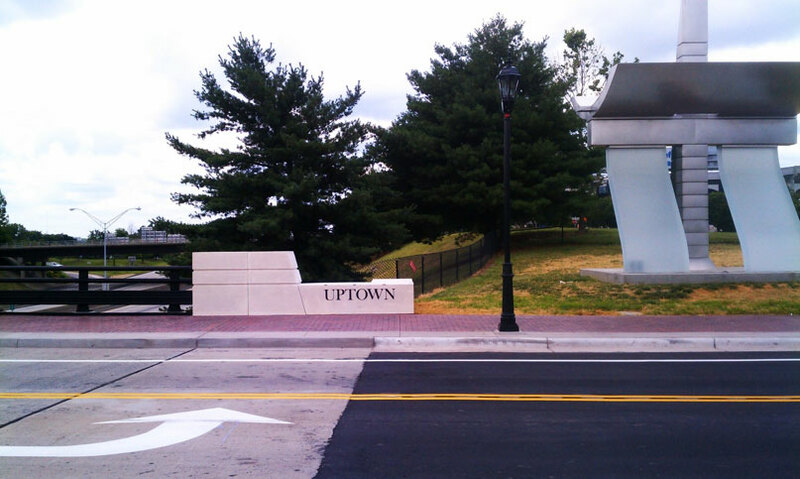 In 2007, the City hired consulting firm HNTB to do a study to determine ways of creating better pedestrian and bicycle connectivity between Uptown and the South End neighborhood (City of Charlotte Department of Transportation, 2008). One of the simplest and least expensive recommendations of the study was to do a road diet on Tryon Street between Uptown and South End, particularly on the bridge. By reducing the vehicular lanes from five lanes to three, bicycle lanes could be added and the sidewalks could be widened. Traffic analysis indicated the road diet would not lead to undue congestion or backups, and structural analysis of the bridge indicated it could support the weight of several feet of additional width added to the concrete sidewalks. Figure 3. A view of Uptown on South Tryon Street before the project. 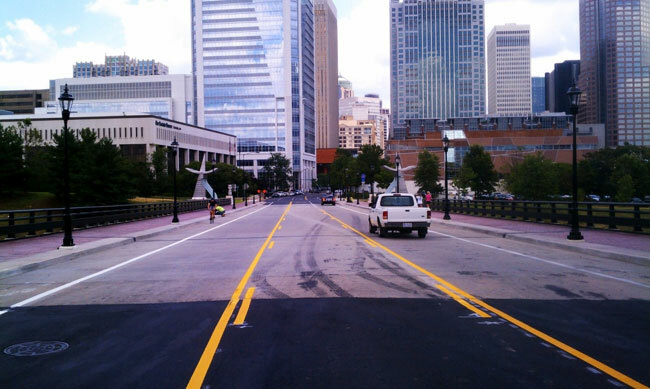 This section of Tryon Street is State-maintained, and in Spring 2010, the North Carolina Department of Transportation (NCDOT) agreed to allow Charlotte to conduct a 90-day trial of the lane reduction using temporary striping. The trial took place from April to July 2010 and was successful with no unacceptable impacts to traffic. NCDOT issued approval to the Charlotte Department of Transportation (CDOT) in July 2010 to make the lane changes permanent, and design of permanent modifications began. When the Democratic National Committee announced it would hold its National Convention in Uptown Charlotte in September 2012, the project was accelerated. Plans were finalized in Fall 2011 and construction began in March 2012 and was completed in June 2012, meeting a two-year design and construction schedule to be ready in time for the convention. Figure 4. After the project, a view of Uptown from the South Tryon St. bridge. The project was funded as part of the City’s Capital Improvement Program (CIP) which is financed through the sale of voter approved bonds. Construction cost $1.1 million and the total project cost was $1.8 million. Changes to traffic volume and/or travel speeds have not been assessed. The impact has been apparent, as it seems that pedestrian and bicyclist use has increased some, although no attempts have been made to quantify changes in bicycle and foot traffic. Several pedestrians and cyclists have made unsolicited positive comments to City staff and officials regarding the improved conditions and appearance. Feedback from users has been very positive, even before the project was completely finished, and people continue to remark on how much more comfortable it is to cross the bridge after project completion. Figure 5. Uptown End Cap.